There's a narrow, two-lane highway just outside Ebbing, Missouri along which a very big commotion comes to pass, even if there's no such town in the Show-Me-State. Ebbing is an imagined village out of the mind of Martin McDonaugh, an Oscar-winning Brit/Irish film director and playwright, who also created two other feature length movies: In Bruges (2008) and Seven Psychopaths (2012). An angry lament for justice is the spark for three fallow billboards on the outskirts of Ebbing to take on a scathing rhetorical interrogative aimed at Ebbing's head cop about why he's not yet apprehended the culprit who raped and murdered a local teenage girl named Angela. How can I better say that Angela's mama, Mildred, is highly pissed? She lets it boil over to pure rage. No one better could play Mildred than Frances McDormand – what a track record this actor has logged giving great performances in really fine motion pictures! And the savvy casting goes on for Three Billboards with other heavyweight actors, most all taking on – slightly overboard, I must say – larger than life characters residing in or near this delightful, small burg nestled in what looks much to me like the sylvan Ozarks of southern Missouri. I say this because I once lived in Branson, Missouri for what seemed a decade but really was only, alas, a couple of years. 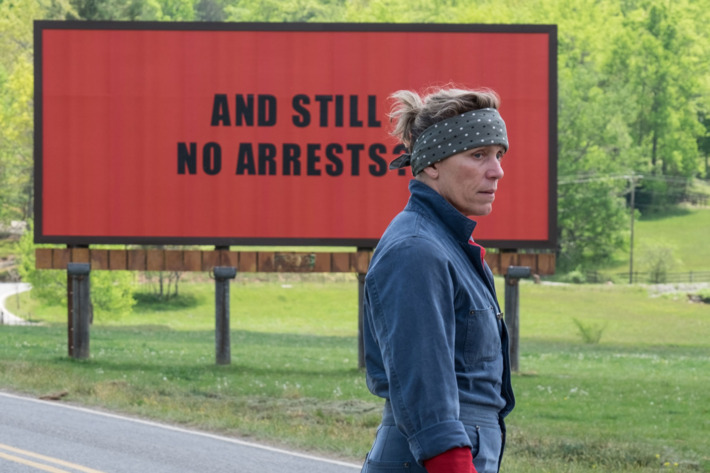 Three Billboards is almost as dark as McDonaugh's Six Shooter, a 27-minute film that won an Oscar for Best Live Action Short Film in 2008. However, this new McDonaugh piece, just like the highway that runs near Mildred's house, provides two lanes, as well. One lane is comedic. The second is filled with violence and fraught with hanging surprises. A couple of those are awkwardly presented .. like the sudden and incredibly handy appearance of fire extinguishers the script requires for an emotional high point near the end of the second act. The other irregular moment playing rather out of tune is an abrupt revelation of just how much a family man William Willoughby is .. better known as Ebbing's Chief of Police. Woody Harrelson got that meaty part. Other familiar faces from earlier McDonaugh films are on set too. Sam Rockwell plays IQ-challenged Officer Dixon, who regularly flies off the handle as the Chief's deputy. Dixon lives with his mama. Strangely, Sandy Martin does that role. Willoughby's desk sergeant is played by Zeljko Ivanek, often seen on CBS-TV's Madame Secretary. Lucas Hedges appears as Mildred's son, Robbie. Hedges is also on board as part of Greta Gerwig's cast in her new film Lady Bird. The diminutive Game of Thrones star Peter Dinklage is an Ebbing local who, late in the script, courts Mildred. (Now, that'sfunny.) John Hawkes plays Mildred's AWOL husband, who's shacking with a female old enough to be his grand daughter, while Abbie Cornish shows up to be Willoughby's wife, Anne. I like McDonaugh's movies and his style. I'd say he has some of Hitchcock in mind insofar as wringing out an audience with suspended suspense .. while stirring a reminiscence of gritty, slow- motion antics the venerable Sam Peckinpah laid into his terrifically violent and bloody movies. McDonaugh has written dialogue into his script to the extent that all his characters, when delivering their lines, could easily be mistaken for sailors if Ebbing were the name of a fictitious seagoing vessel and not a little town nowhere in Missouri. No Comment to " Chew's Movie Reviews - Three Billboards Outside Ebbing Missouri "